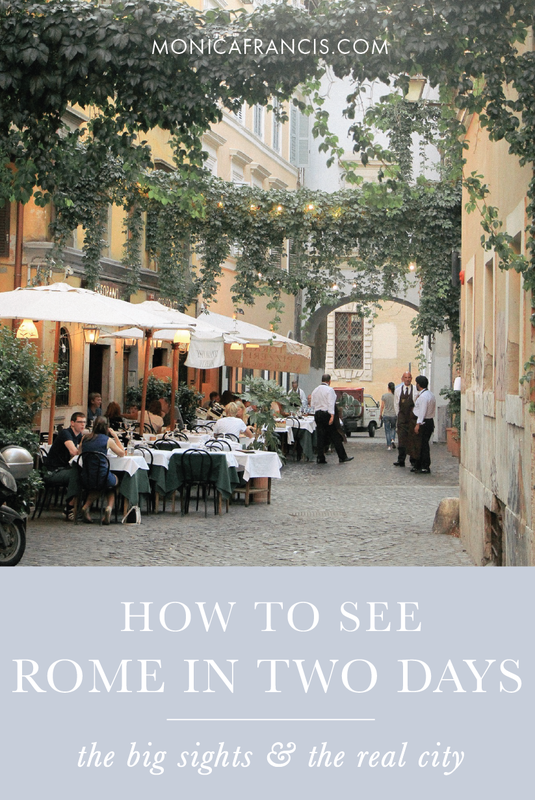 An ardent fan of big cities, gelato, Roman Holiday, and cobblestone streets, it's not surprising that I loved Rome. While I was ready to be surrounded by the ancient history and modern bustle of the Eternal City, I was surprised by how incredibly walkable and green it was, with leafy trees lining the path along the Tiber river and glossy vines climbing colorful buildings in Trastevere. Of course Rome is also covered with tourists almost any time of year, so a quick visit calls for some strategy. With only a couple days to explore, you'll want to reserve your tickets and restaurants in advance whenever possible. A bit of legwork up front will save you hours of waiting in line, and keep you from stumbling into an overpriced tourist trap for dinner out of desperation. You'll also save time by staying in a central location like Campo de' Fiori (we stayed here). Because there's so much to see, be sure to take a couple breaks each day - a long lunch in the shade, a place to sit with a cone of gelato and watch the city go by. Buongiorno, Roma! Make sure you're wearing your best Roman Holiday outfit (you know, this skirt and this top with these sandals), and start the day with a cappuccino and a pastry. For a proper introduction to Rome, schedule a Vespa tour for the morning. In just a few hours your guide will take you on a personally tailored tour of sights in the city, sharing history, stories, and hidden gems along the way. Just trust the glowing reviews. You'll have plenty of opportunities for photos, and likely one for gelato, too! For a leisurely lunch, find an outdoor table at pizzeria Emma. When you've finished your last sip of wine, head outside for some exploring on foot. Wind your way through the charming side streets over to the weekend market Mercato Monti, admiring the Colosseum and Roman Forum again along the way. At the market, spend an hour or so hopping from vendor to vendor, browsing their collections of art, vintage accessories, and handmade goods for sale. As the afternoon wears on, walk up Aventine Hill to Giardino Degli Aranci. Walk to the edge of the garden for my favorite view of Rome. It's almost always quiet up here, but you might be lucky enough to find some musicians playing. Relax here for a while, watching the sun begin to dip over the terracotta rooftops - it's a perfect place to be for sunset. When you're ready to move on, walk a little way down the southern side of the hill until you see a few people gathered by a pair of large green doors. Join the queue to peer through the Aventine Keyhole and see the archway of foliage that perfectly frames the dome of St. Peter's Basilica in the distance. Cross the river to wander through the charming Trastevere neighborhood before settling in for dinner at Pianostrada Laboratorio di Cucina. End the day with a stroll along the river - it's a good idea any time, but particularly magical at night. Bright and early, make your way to the Vatican and skip the famously long lines (you reserved tickets in advance here, of course). Spend the morning taking in all the magnificent art and architecture in the museums. It's truly breathtaking to see the Sistine Chapel and The School of Athens in person, and one of my favorite rooms was one I hadn't heard of before: the Gallery of the Maps. From the Sistine Chapel, there's a little-known shortcut into St. Peter's Basilica, avoiding another long line to reenter the Vatican complex. With your back to The Last Judgement, exit through the door in the back right corner (instead of the left), then follow the path straight into the church. You won't be the only one taking this route - less time waiting means more time to admire the incredibly ornate detail of the basilica. Be sure that your shoulders & knees are covered for your visit to the Vatican. The Sistine Chapel is closed Sunday. If you want to settle in for a sit-down lunch, reserve a table at La Zanzara or Il Sorpasso. Try some pizza at Bonci or a sandwich from Fa-bio for a quick and delicious meal. After eating, walk towards the river to see Castel Sant'Angelo. Cross the pedestrian bridge Ponte Sant'Angelo, and spend the next couple of hours visiting the fairytale library Biblioteca Angelica, or some sights that are still on your list - the Pantheon and the Trevi Fountain aren't far away. Whenever you like, break for gelato at Come Il Latte. A bit before sunset, venture out to Villa Borghese and its public gardens that cover almost 200 acres. If your feet are starting to protest all this walking, rent a cart to keep exploring or sit by the lake at the Temple of Asclepius. Either way, don't miss the view over the city from the Pinoco Terrace. Spend your final evening in Rome having a fantastic dinner at Colline Emiliane, then - do you already know what I'm going to say? - take one last stroll along the Tiber in the moonlight.